This is one Lord of the Rongs collector’s piece you need to take a close look at. 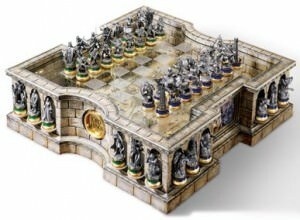 With incredible details, each chess piece is sculpted to represent characters from the awsome Lord of the Rings movie made in fine pewter. The board is costructed using cold cast porcelain and the playing surface is a nice durable plexi-glass, you will also find a map of Middle-earth below the playing surface. The Lord of the Rings chess set is made by Noble and is a high end product, this is a collectors item to pass along for generations.